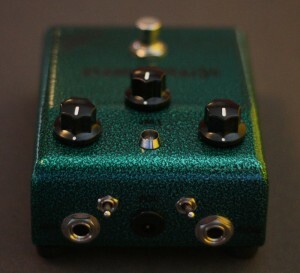 I’m extremely happy to announce EffectsBay.com’s third pedal give-away, and the first of 2010!!! That makes three months in a row, hopefully we can continue with this pace! 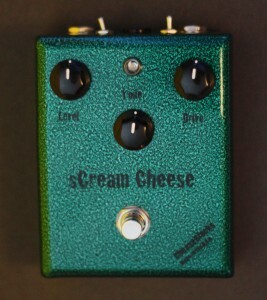 For this pedal give-away, I’ll be giving away a Cheese Blocks Effects sCream Cheese 2.0. Overdrive, and built by Matt Cheezem (@CheeseBlocks). The sCream Cheese normally sells for $130+shipping, so here is a chance to own it for FREE! How do you get a chance to win this pedal? It’s super simple. Second, you just need to fill out the form below. This contest is only for the US though. I’m personally shipping this pedal out, so I’m not going to offer any international shipping with this particular give-away. -GREAT enclosures from our buddy Mike at pedalenclosures.com . These things are built like a tank! Very heavy duty. 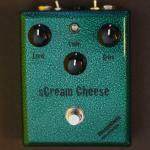 Click here for more info on the sCream Cheese 2.0 Overdrive! This view shows the low boost switch as well as a switch to customize which clipping diode to use. The last contest there was some confusion on the process, so I’ll explain it in further detail. Fill out the form below, in 2 weeks (January 31) I’ll randomly pick 3 entries as finalists. I’ll email the 3 finalists and the first one out of the 3 that emails me back will be the winner. You must enter a ‘valid’ email address, bounce back emails will be rejected. One entry per person. After the winner has been notified and all is good (I’ve retrieved mailing address, etc), I’ll mail off the pedal USPS. Again, this give-away is restricted to the United States only. To enter fill out the form below. I’m asking the question “What is your #1 guitar?”. Everyone has their #1 right? Let’s hear what yours is! Stoked!!!! Iv been wanting to try one of these out, but winning one would pretty much make my life Amazing FOREVER!